Salmon with the Sunday Times is a New Yorker’s birthright, but it’s rarely the salty belly lox our grandparents loved that we lay across our H&H poppy with a schmear. At the least, we expect nova, as in Nova Scotia (though the fish usually comes from the Pacific), which is cured, then cold-smoked for a sweeter, richer flavor. So whose is best? Your bubbe would be shocked at our findings. Pros: Nice and pink, not oversalted, this nova from Nova Scotia—which Zabar’s cures and smokes itself—would be perfect to scramble with eggs, or as the base of a Benedict. Cons: A bit fishy, and lacking in nice salmon kick—and what about that slightly oily aftertaste? But for a basic bagel topping, this is it. Pros: The Sturgeon King’s eastern nova is not too fatty, not too stringy—no more than passable. Cons: Raggedly cut and an oddly light pink, as if drained of flavor, this nova tasted like it hadn’t been smoked. Stick to sturgeon, Barney. Pros: For pure, clean, buttery salmon flavor, subtle smoke, and textbook slicing—with not a hint of a rough edge—nothing beats Eli’s. “Excellent” was about all one delighted nosher could say before he gobbled down another slice. Cons: The aftertaste is a bit salty, but that’s nothing another bite or three won’t cure. Pros: The Upper West Side’s gourmet megagrocer cures and smokes its own nova. Clearly they know what they’re doing: “First choice on the sniff test,” one taster exclaimed after sticking her nose into the packet of gauzy pink slices. First on the taste test, too—it melts on the tongue with an intense smokiness almost reminiscent of good bacon. Cons: There’s no East Side or downtown Fairway. Yet. Pros: Comes in a fancy insulated bag. Cons: Thick-sliced, garish, and fatty, this costly North Atlantic nova was instantly declared “unappealing to the eye.” The palate fared no better: Petrossian’s offering was chewy and flavorless, except for the slick of oil—and disappointment—it left in our tasters’ mouths. Pros: This classic Lower East Side “appetizing” shop offers a nova from Canada’s Gaspé Peninsula that’s perfectly pink-orange and sliced extremely thin. Cons: Looks can be deceiving. Our tasters were unenthusiastic about bland, nondescript, slightly slimy salmon. But they raved over Russ’s rare Danish Baltic nova, a rich, super-smoky, almost champagne-colored salmon available in winter. Steve Jenkins—Fairway junior partner, “master cheesemonger,” and all-around foodie—knows from nova. 1. Taste-test. Every batch of salmon is different—it could be too salty, too old, stale, or refrigerator-flavored. If it doesn’t delight you, move on. 2. Buy fresh. Unless you need to keep it a while, don’t buy precut, vacuum-packed salmon. Nothing is as luxurious as silky nova hand-sliced by a practiced counterman. 3. Get busy. Make sure you’re in a place that moves a lot of salmon—and therefore always has fresh fish. If the counter looks neglected, shop elsewhere. 4. Keep it neat. The salmon has to be cleanly sliced around the edges; the pin bones should be removed with tweezers. If it’s bruised, blemished, or discolored, skip it. 5. Go global. 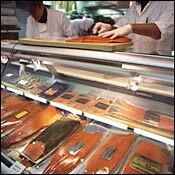 Foreign salmon—especially Norwegian—typically tastes better than domestic, especially the often insipid Pacific breeds.